Love the aesthetics of wood, stone, or ceramic, but looking for something within your budget? Laminate flooring options from our company is the perfect solution. Achieve a beautiful look for your floors while managing to stay under budget. With the money that you save on our affordable flooring, you can complete your other remodeling ideas and turn your house into your dream home. Impress your guests and greet them in style when you install our sleek surface coverings. Whether you are going for a charming, rustic feel or a more modern and up-to-date look, we have a large variety of options that you are sure to love. Add warmth to your room with our laminate wood flooring or give your bathroom an elegant appearance with our laminate tile flooring. Extreme temperatures can deter you from having wood floors installed in your home, as solid wood tends to warp in conditions of high humidity and moisture. Laminate wood flooring is an ideal alternative for those who want to save money and achieve a classy style at the same time. Take your decorative room theme to the next level with our gorgeous laminate wood flooring in light, medium, or dark finish styles. One of the great attributes of this type of flooring is that it resists unappealing stains and scratches. The next time the dog scratches its claws against the ground or your children spill their drinks on the floor, you can rest assured that your floors are well-protected. Our faux wood flooring comes in many colors, variations, grains, and styles, so you are sure to find a design that suits your color-coordinated room. When you are looking for floors that are easy to clean and were designed to withstand moisture, choose our laminate tile flooring option. This type of surface covering can be quickly swept up or mopped, which makes it great for busy households, working parents, and those who enjoy a worry-free lifestyle at home. 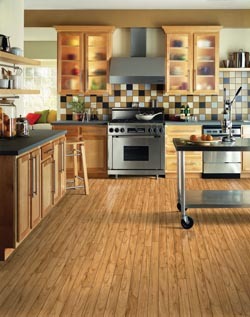 You never have to worry about stains or low-quality flooring again when you choose laminate tile for your floors. Think of all the style possibilities you have with our laminate tile flooring. You can mix and match the stones, and our installers can lay them down in certain borders or designs to give your space a unique and attention-getting look. This particular flooring option is a very popular selection for bathrooms and kitchens. Thanks to modern technology, laminate floors have come a long way in the last few years. All of our laminate materials are composed of four layers, which include the wear layer, the design layer, the core layer, and the back layer. Each layer has its own separate function to give you a sturdy and lasting foundation. The wear layer serves as a clear layer of protection that helps your floor stand up against stains, aging, and other negative effects. The design layer is placed below the wear layer, and it is composed of a hi-resolution image that emulates the look of authentic hardwood or tile flooring surfaces. Next, the core and back layers reinforce your floor’s durability and support its overall structure. Each layer is bonded together using high heat for a dependable flooring surface that never disappoints. Your floors are an essential part of your home. Make sure they are properly installed the first time by hiring our experienced and certified flooring professionals for your laminate flooring installation. We offer superior service, and we have a history installing flooring in all types and sizes of rooms. Put experience on your side for your floor remodeling project by working with the highly trained and knowledgeable installers at our company. Do your part to see that your laminate flooring installation goes smoothly by taking care of a few necessary preparations. Prior to your installation, we ask that you remove your old flooring and empty out the room where the new flooring will be placed. It is also a good idea to finish any interior room painting before we begin. Other helpful preparations include removing any hanging objects, baseboards, and trim if possible, and making sure that electrical power is available for our installation crew. Speak to one of our representatives today for more information about our impressive selection of laminate floors or stop by our showroom to see our gorgeous displays in person. If you are budget-minded, be sure to ask us how you can qualify for $100 off of your next purchase of laminate tiles and laminate tile installation. Contact us to give your property a whole new appearance with our transformative laminate flooring. We proudly serve the communities of Clive, Des Moines, West Des Moines, Urbandale, and Grimes, IA.